Gourds have been grown for centuries as part of the homestead garden. They were one of the first domesticated crops. Gourds were used as utensils, to make musical instruments, and for ornamentation (jewelry pieces were made from them). 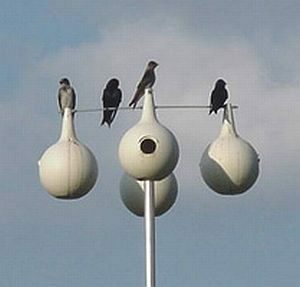 A common modern use is for birdhouses, typically for the Purple Martin. They are also used in art. In fact, some simply stunning art is made from gourds right here in our local artist communities. Gourds are in the family of Cucurbita and are related to cucumbers, melons, and squash. They are often named for either their shape (apple gourd, serpent gourd, egg gourd) or their use (birdhouse gourd, dipper gourd, bottle gourd). It is not difficult to grow gourds and they are beautiful in the garden. They have a few needs that must be met, but as long as those are tended to, you should be able to grow enough gourds for your own use, and to share with family, friends, and fellow artists or bird lovers. Most gourds are not considered edible, but a few can be eaten at a certain stage of maturity. 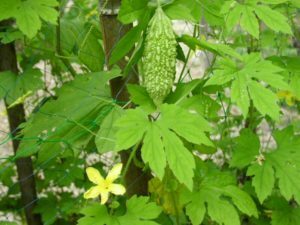 Luffa is edible if harvested when immature (about 6” – 8”). It is popular in oriental dishes and is called Chinese Okra, even though it is not related to okra in any way. Bitter Melon is a beautiful and very useful plant. The melons are a popular component of Asian cuisine. The leaves can be harvested and used in soups. The vine itself is quite lovely and the flowers are beautiful bright yellow. Bitter Melon is also used in Chinese medicine for treatment of Type 2 diabetes. Smaller varieties of gourds should be planted on a trellis, an arbor, a fence, or other strong support. These gourds are small and light enough that they can be allowed to hang from the arbor without extra support. Larger gourd varieties should be grown on the ground in large mounds called hills, similar to growing watermelons. As the fruits form and begin to mature, they should be supported on a pad of loose mulch, such as dry hay or pine straw to keep them from direct ground contact. They can also be set on a coffee can or brick. If a strong arbor is available, gourd vines can be grown up and over the arbor and the gourds can be allowed to hang down through the ceiling of the arbor as they mature. 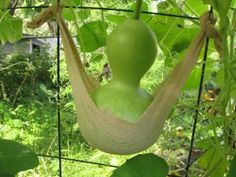 If all that is available is a strong trellis, large, heavy gourds can be supported with slings of old sheeting or burlap tied to the trellis. These gourds can get heavy as they mature. Smaller gourds that are grown on a trellis can be spaced 18” – 24” apart. They should be trained to grow up the trellis 6’ – 8’. Some may grow even taller. You can pinch out the top of the vine once it reaches the top of the trellis. This will stimulate the formation of more laterals, and laterals seem to produce more female flowers. Gourds that are grown in hills need to be planted at least 4’ – 6’ apart. Allow 8’ – 10’ between rows of hills so you have room to access all sides of the plants. Gourds have large leaves, vigorous vines, and large fruits. They need well prepared, very fertile soil to do well. Work several inches of good quality compost or well-rotted and aged manure into the soil to a depth of at least 8”. Apply 1 cup of slow release organic fertilizer such as Arbor Gate Organic Blend or Microlife per plant and work this into the top few inches before planting. Gourds are slow to germinate, taking anywhere from one to six weeks. The average seed germination rate is about 60% – 80%. Gourd seeds are large and the shells are thick. You can hasten germination by clipping the edges of the seed close to the end point. Do not clip the tip – the hilum end of the seed (the seed’s bellybutton). Soak the seeds overnight to ensure complete imbibition which will stimulate germination. The pre-treated seeds can be direct sown after all danger of frost is passed. Plant ½” – 1” deep and lay the seed flat on its side. Gourds prefer warm soil and will not germinate if the soil temperature is below 60°F (every gardener needs a good soil thermometer). You can get a jump on the season (and control the soil temperature) by starting your seed indoors about 4 weeks before setting the plants out. You can start them indoors from mid-February to mid-March to be set out in March or April. Gourds do not like to have their roots disturbed, so use 4” – 6” containers and handle them gently when you set them out. Gourds need a long, hot growing season. They will take from 100 – 180 days from sprouting to maturity, depending on variety. The vines will need a lot of water, especially when the fruits are expanding in size, all through their growing season. Once the vines start to run, side dress with another ½ cup of balanced, slow-release organic fertilizer. Avoid high nitrogen fertilizers which will result in lush leaf growth at the expense of fruit production. Potash (potassium) is beneficial for gourds. It makes the shell walls thicker and supports flowering and fruiting. Greensand and kelp meal are good sources for potash. Use greensand at about 1 cup for every 10 square feet. Slow down watering in August to trigger the fruits to start the hardening and drying process. Don’t worry if you lose a few fruits here; it is normal for a few to rot and wither on the vine. Stop watering in September or October. You will see that the vines are starting to droop, wither, and dry out. Gourds don’t have many problems, but they are susceptible to some of the same issues that squash and cucumbers have – squash bugs, leaf-footed bugs, cucumber beetles, and squash vine borer. Use the same organic treatments for these as you would for squash. The gourd society does recommend companion planting as a preventative method. Radishes, catnip, broccoli, dill, and French marigolds are all good companions for gourds. Powdery mildew is sometimes a problem. This can be treated with lime-sulfur sprays or a combination of 1 T baking soda, 1 tsp Neem oil, and 1 tsp liquid soap (not detergent) in one gallon of water. Allow the gourds to dry on the vine. Lift them occasionally to see if they are getting lighter. This will mean that the water is evaporating from the pulp. Do not cut the gourds until all of the stems and tendrils are brown. If you cut them too early, they will just rot. You can’t leave them on the vine too long, but you can take them too early. When you cut the gourd, leave a few inches of the stem. 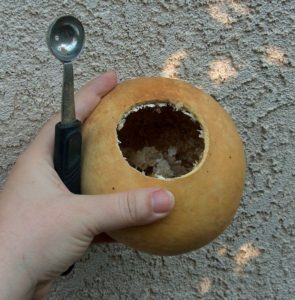 It looks nice and will serve as a handle when you clean the gourd. You can always remove it later if needed for your craft. Gourds may form a mold on the outer skin as they dry. This is normal. As long as the shell is still hard, there is no harm. Different gourds, even the ones on the same vine, will take different times to dry. It may be from 1 – 6 months. After they are removed from the vine they need to be kept in a very well ventilated place. You can hang them from the ceiling of the garage in paper or burlap bags. Check them occasionally. They are ready for crafting when the seeds rattle inside. If the gourds are moldy you must remove the mold before you proceed. Put the gourds in a tub large enough to cover them completely with water. Fill the tub with water. The gourds are buoyant and will float. Weight them down with several heavy wet towels. Turn them occasionally and test the moldy spots by rubbing to see if they are loosened. Once they are ready, use a metal kitchen scrubber to remove the mold. Rinse regularly as you wash. After they are clean, let them dry completely. They are now ready to be used. If you are only going to embellish the outside, it is not necessary to clean the inside. You can paint, stain, wood burn, or carve the shell. Many artists use leather dyes. If you chose to use these dyes, they must be sealed afterward. Regular floor wax can be used for sealing. This can be a real chore. You should wear a dust mask the entire time and it is best to work outdoors. There are several tools you can use to cut the gourd open – a jigsaw, a sheetrock hole saw, a Dremel tool. If you want to preserve the cap to use as a lid or as part of an art piece, cut carefully. You should have a variety of tools available to scrape out the dry pulp and seeds – spoons, ice cream scoop, brass brushes. You can sand the inside after you remove the bulk of the material. Gourds can be used whole, cut into bowls or scoops, or pieces can be cut out to use for jewelry or to embellish other gourds. They can be cut, carved, burned, painted, stained, or engraved. Holes can be drilled so that feathers, beads, bells, glass, buttons, or leather or fiber threading can be added. There is virtually no limit. Once you have cleaned out all that seed it will be tempting to save it to plant the next season. It is best to buy seed fresh each year unless you have selected, isolated, hand-pollinated and bagged a few fruits just for this purpose. Gourds will cross-pollinate with each other and with other Cucurbitaceae. It is unlikely that your seed will produce anything like the fruit it came from.